Philadelphia and Boston were the first two American cities to institute school lunch programs, starting at the end of the 19th century. These efforts were spearheaded largely by welfare organizations, such as the Women’s Educational and Industrial Union in Boston and the Starr Center Association in Philadelphia, which began serving up hot meals for the price of a penny in high schools as early as 1894. It wasn’t until the Great Depression that the Federal government became involved in school food programs. In the early 1930s, farmers were facing financial ruin thanks to price collapses, laborers were having extreme difficulty finding work, and poor children were experiencing increasing malnutrition and hunger. School lunch programs emerged as the perfect solution to all three problems. But the school lunch program was not a permanent mandate. When food supplies dwindled and labor became scarce during World War II, the number of school meals served declined precipitously. 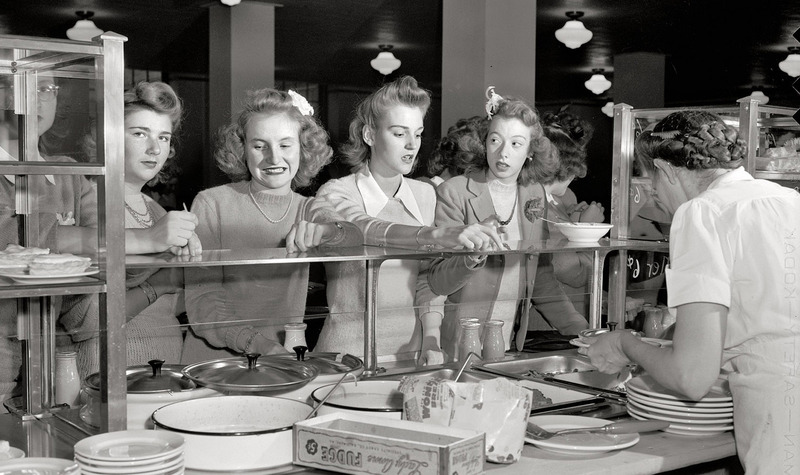 Recognizing the benefits of keeping children well fed and healthy, in 1946 Congress passed the National School Lunch Act.